Are you interested in setting up an account with ChurchPartner? We offer extended billing terms to customers who are in good financial standing and have completed and submitted our simple credit application. Please choose the link below that best describes your organization. You can download the .pdf version of this, complete it and submit it by mail or fax! All accounts that qualify for tax exemption must submit a copy of their letter or certificate of exemption as a hard copy to our offices at the address listed below. Please attention this to our "New Accounts" department. 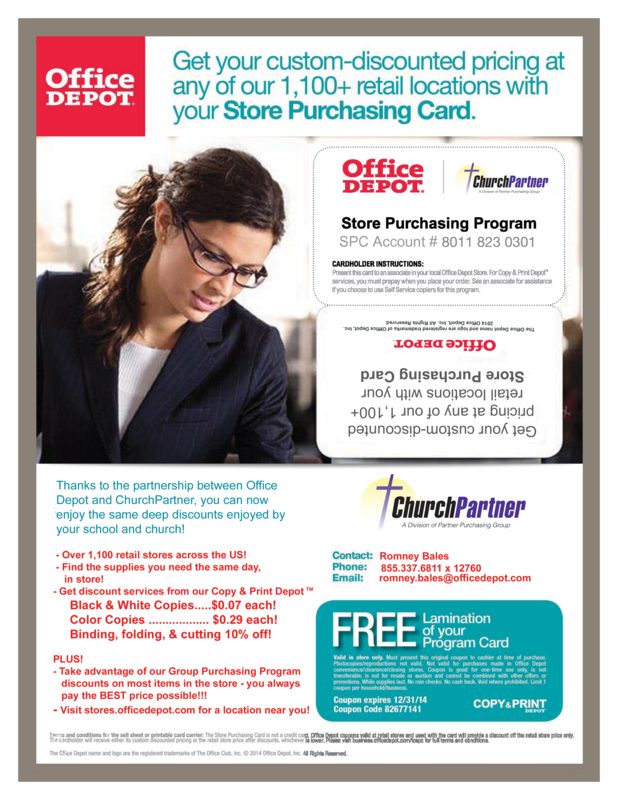 Now you, your parishioners, your teachers, and your parents can take advantage of the same great pricing you enjoy through our Office Depot/Preferred Pricing Program! Print out the Printable Store Purchasing Card below and you can take advantage of the same great prices our organizations currently get at your local Office Depot store! Just present the card at check out and your deeper discounts will appear!